A lot of adults struggle with the idea of going to the dentist themselves, let alone getting their kids excited about regular dental check-ups. But, with regular visits to your dentist such an essential aspect of overall health, you need to make sure you can get your kids excited. Here are some expert tips to on avoiding the tears and tantrums every time your kids go for their check-ups. You have to be careful with how you react to dental visits. If you show fear or express any sign of alarm, it’s natural that your kids will follow suit. So, when it’s time for your visit, show some excitement and explain why you’re excited. Say that when you leave you’ll have nice clean teeth and the dentist was very gentle and friendly. It’s always best to be completely honest, so there are no surprises. Your kids will also feel far more comfortable if they know exactly what to expect. Make sure you answer all of your kids questions and be honest. If they have any concerns, don’t just downplay or ignore them – talk them through it. Use language they will understand and never fall into the trap of telling white-lies, or they won’t trust you when they realise you weren’t telling the truth. It’s a good idea to get your child used to the concept of the ‘dentist’ before their appointment. You can do this by acting the role of the dentist with them or with a toy. You can even find some books on dentistry or download some apps or videos. The internet makes it easy to prepare your kids, and that way there’ll be no fear of the ‘new’ to contend with. When you get to the dentist, make sure they are involved in the discussion with the dentist. Get them to choose things, like the colour of their braces, and get them to look at the filling material or their night plate. Kids love feeling in charge, and this extends to their experience at the clinic. Your kids should be taken for a check-up as soon as their first tooth has appeared. But, you can get them used to the environment by bringing them along to your appointments from the time they are babies. That way they’ll know the sights and smells, and they can even build up a relationship with the dentist. This is just one more way of removing the fear of the unknown. Remember, dentists are highly-trained and experienced professionals. They’ve looked in thousands of child’s mouths, and while this may be new for you, it’s not new for them. Don’t loom over the chair with a nervous look on your face and don’t interfere with the process. Let the dentist go about their job and show a look of calm throughout. If your child shows any bad behaviour, the dentist will know what to do. They probably have kids themselves so don’t be embarrassed if things go pear-shaped. Your dentist just cares about keeping your child’s teeth healthy, everything else is just an obstacle towards that final goal. Whatever happens during the appointment, be positive. Don’t comment on negative behaviour, just use positive reinforcement to create a positive association. The worst thing to do is to buy them sugary treats as a way of creating this association. Remember, sugar is bad. If you need to bribe, go with non-tooth destroying prizes. 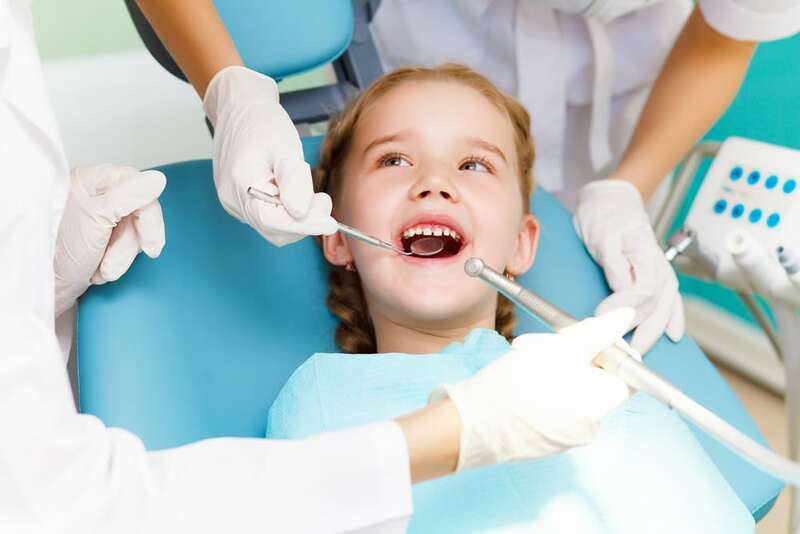 You need to go with a dentistry that is experienced in paediatric dentistry. That way you will be choosing someone that understands children and how to give them a positive experience. Their clinic will also be set up for young people by having smaller tools and chairs to suit their smaller frames. Most importantly, you need a dentist that understands the science behind paediatric care. Babies and children require different care than adults because their teeth are still developing. Apart from the science, they will also know how to create healthy habits for life by providing education on how to brush, when they should start flossing as well as the types of foods and drinks they should be enjoying to look after their teeth. Going to the dentist doesn’t have to be scary for you or your kids, follow these tips and make it an exciting part of their health journey. Here at dhealth, Dr Anna has an unique and special way when dealing with children, she is extremely friendly and understanding, having 4 and 6 year old children of her own, she sure knows how to make children laugh and create a super positive experience at the dentist!! You can learn more about our friendly paediatric team here!